While doors with windows can be beautiful, they often leave less privacy for our home than we desire. Learn how to choose the perfect blinds for French doors, sliding glass doors, and front doors. A common problem for French Door blinds is that the handles get in the way of functionality. The solution is to buy shallow blinds for your French doors that fit comfortably between the door and decorative handles. French door blinds should enhance the beauty of your doors, and match the other window treatments in the room. The blinds or shades you choose may depend on the amount of light you want to let in. If you prefer to completely block light, choose a blackout roller or honeycomb shade. If you prefer to allow some light in, choose a light filtering shade. You can use any type of window treatment for French doors, but there are a few things you need to consider. Blinds for doors will be mounted on the outside of the window because unlike regular windows, the French door window has no depth. Look for window treatments that are available in an outside mount. Your door will most likely have a handle that might get in the way of operating the window treatment. The solution is to buy shallow blinds that fit comfortably between the door and decorative handles. Most 1” blinds, roller shades and honeycomb shades will fit behind the door handle, assuming there is 1” clearance. When your window treatment is lowered, it may swing when the door is opened and closed. To prevent this, use hold down brackets to keep the bottom of the blind or shade in place. These can be added to most blinds and shades at checkout. Durable and easy to clean – perfect for high traffic areas. Sliding glass doors are a great feature for any home. They give easy access to the outside, without intruding on your indoor or outdoor space, provide you with a great view and also let in a lot of natural light from the outside. If you have any other window treatments around the room, it is a good idea to choose blinds for doors that will coordinate with the other windows. Vertical cellular shades, pictured above, are a great choice for this scenario. Sliding doors open vertically, so it is recommended that window treatment should open in the same direction as the door itself. Like other doors in a house, sliding doors are usually high traffic areas, be sure to choose a durable window treatment that can handle the daily use. If you prefer something other than vertical blinds for your sliding doors, you still have quite a few options. In terms of soft fabric window treatments that can cover wider windows, we recommend roller shades, roman shades and draperies. Each of these types of window treatments will give you a number of fabric and style choices that can completely cover your sliding glass doors. Many front door windows present different challenges as they come in many shapes and sizes. With blinds for doors, there is no reason you can’t control light and privacy like the other windows in your home. Aluminum blinds and cellular shades can be used as window treatments for front doors. They are usually inexpensive and take up little space when raised. They come in a variety of different colors and widths which allows you to find the one to go with your door. For a sleeker look, try the Blinds.com Brand Completely Cordless Mini Blind. Sidelight Windows are common around front door areas. Privacy is often a consideration for these windows, and it is important to consider how your window treatment will look from the outside. Popular window treatments for sidelight windows include honeycomb shades, wood or faux wood blinds, mini blinds, shutters or roller shades. If you have a curved window above your door, arched window coverings are an easy solution. Cellular arches fan into a semi-circle and wood arches create a sunburst of slats for a shutter-like look. They can be either mounted on the inside or outside depending on the mounting depth and surface. Shutters can be made in many custom shapes – call us for help ordering! Leave your door blinds questions in the comments, or give us a call at 800-505-1905. 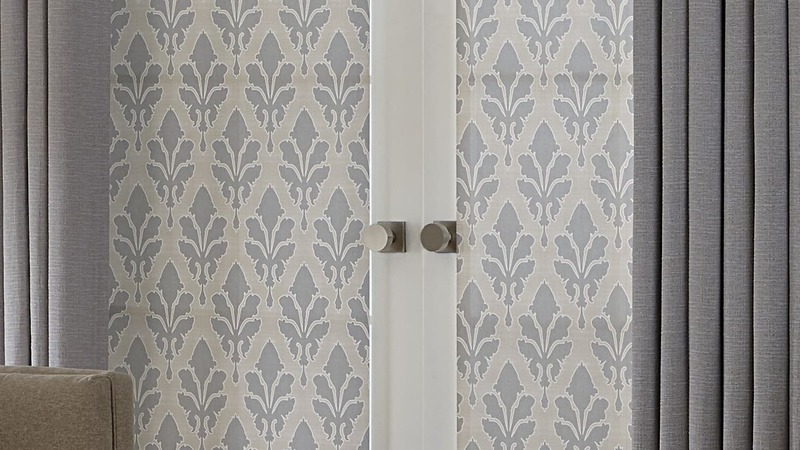 If you’re ready to order, read How To Measure For Door Blinds next! Thanks for explaining that arched window coverings provide an easy solution if you have a curved window above your door. My husband and I just moved to a new home, and our front door has a curved window above it pretty similar to the one in the picture. I wasn’t sure what window covering options would be available in that shape, so I’m glad to hear that arched window coverings were pretty much made for the job. Kudos for such a wonderful post. I believe searching for blinds that match to door is not an easy task to deal with. After reading this trustworthy guide on blinds for doors, makes easy for me to opt best and compatible blinds for my doors to make a spectacular home. My wife and I have been thinking about getting new blinds for our back doors, but we weren’t sure how to find the right one. I really like that you say that roller shades will fit with door handles better. It would be nice to know that the the handle won’t keep the blinds from going over the entire window. Perfect way to still have sun light and my privacy!! Very Nice thought. Thanks for getting such a useful information. Amazing options of blinds for the different types of door. So, hassle free buying of doors without thinking what type of blinds will go with what. I find it really helpful. Going through your blog getting a very nice thoughts and knowledge about blinds your ultimate guide about blinds of doors. Thank you for sharing your blog and great views about Blinds. I liked when you talked bout getting blinds based on the amount of light you want to let in. I can see that understanding this can help you make sure you buy a set that will serve it’s purpose and not only look good on your walls. It makes sense that anyone looking into this would want to make sure they take their time and compare prices from several stores until they find what you are looking for. In my current house we have a set of french doors that allow you to see what’s going on in the office that they open to and provide no privacy. I really appreciate how this article makes mention of how you can mount some good blinds on french doors. I am definitely going to look into this further!